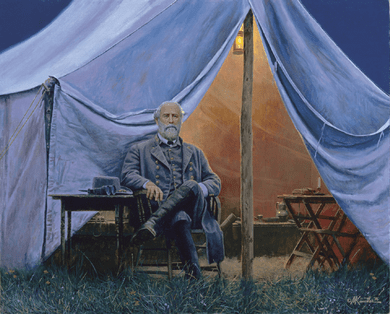 Mort Kunstler Handsigned and Numbered Limited Edition Giclee on Paper:"The Loneliness of Command"
Edition: Paper Signed Artist's Proof, Limited Edition to 100. COA included. About the Art: I have always thought that an artist should be like a major league pitcher. The pitcher constantly tries to fool the batter, throwing a fastball, a slider or a curve. I try to surprise my viewer by doing a night scene followed by one with bright sunlight; a complex picture followed by a simple scene, or an action painting after completing a quiet one. After painting Wayside Farewell, a very complex scene. I was compelled to think about a more simple composition. The Loneliness of Command is the result of that thinking. I had done a mixed media painting of The Loneliness of Command for my Jackson and Lee book and felt that by using that painting as a study, I could develop an oil that would give me the desired effect. The key to the success of a painting of this type is the simplicity of the composition. But without a "great" Lee and a special lighting effect, I did not think it would be successful. The composition, lighting and Lee had worked for me in the "study" so it made the oil that much easier to do. I have painted Lee many times but always find that the angle of the head or the lighting is different every time. I solve problems of this type by working with a head sculpture of Lee and lighting it with a flashlight to get the desired lighting effect and angle. Then I do preliminary charcoal sketches. By following this kind of procedure, I ensure that I will paint the best possible Lee I can do. The pose of the figure is also a very important element. It is designed to capture Lee's dignity as well as the burden of command that the great Confederate general must have felt virtually every waking moment during the entire war.